Meet my utterly delightful Canadian second cousin Lorry Mackay a.k.a. Sals or Sally (Don't ask why she maintains a secret identity. It's a family thang. Shhh.). Isn't Sals a cutie? And check out the charming daisy necklace she's wearing. Great, isn't it? Want to make one with us? Well, then...let's get busy. Did you gather the supplies? The glass seed beads, scissors, and either thin fishing line or the cool stretchy thread that can be bought at the craft store? Lean in close and I'll tell you a Simple Saturday secret. I went ahead and bought that fancy stretchy cord because I hoped that Sally would enjoy making Beaded Daisy Chains with me and want to make lots of them for her friends. She did. We did. It's all good. To begin, cut a 3 foot piece of thread from the spool. Slip one bead on the thread. Secure the bead to the thread by tying a few knots around it, leaving about 2 inches of the thread at the end. Then thread 10 beads on the string. I call these beads the 'stem'. You can call them whatever you want to. Now thread 6 petal beads onto the string. Next, loop the end of the thread all the way around the cluster of petal beads. Insert the end of the thread into the back side of the first petal bead. Ready for the inside of the daisy? Okay, slip a bead onto the end of the thread. Stay inspired. You're almost there! 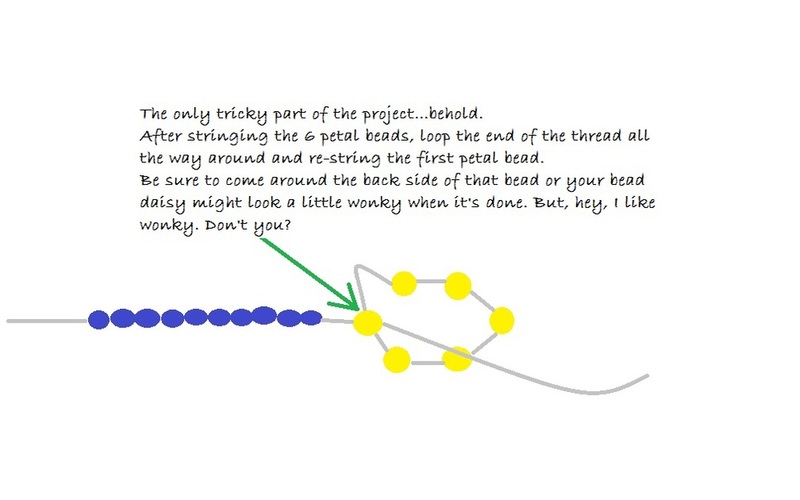 Now take the end of your string and slip it into the 4th bead in your daisy cluster. Go ahead and tighten the beaded daisy snug up against the end of the stem. There! You did it!! All you have to do now is repeat the pattern all over again and again and again and again... Nothing to it. If you prefer to make a shortened version to begin with a nice little bracelet is always nice. Really...once you get the hang of making Simple Saturday Beaded Daisy Chain necklaces, you just can't stop. They're that much fun to make. Isn't that right Sally/Lorry/Sals? So good to see you, sweetheart.